Keri Reese Zickuhr M.D., is an orthopaedic surgeon in Torrance, California specializing in nonsurgical and surgical management of foot and ankle injuries and conditions. 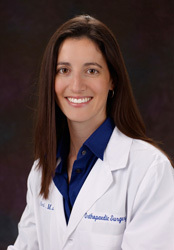 She practices medicine with the goal of helping patients live active and healthy lives. surgery to total ankle replacements. San Pedro, Palos Verdes, Torrance, as well as Long Beach and Los Angeles. X-Ray Located within the office for your convenience. Physical Therapy For the past 15 years, South Bay Orthopaedic Specialists Physical Therapy Department specializes in pre/post surgical rehabilitation, sport injury treatment, injury prevention program, as well as high-end sports performance and fitness training. Surgery Center Fully equipped operating rooms within the same building. No need to visit a hospital. MRI State-of-the-art MRI located within the office. Why choose an Orthopaedic Foot & Ankle Surgeon?